Calamovilfa longifolia (Hook. ) Scribn. Culms: Erect, usually solitary, stout, solid or hollow near base, glabrous, waxy. Blades: Flat near base but rolling inward near thead-like tip, 4 to 24 inches long, 1/6 to 1/3 inch wide near base, slightly rough. Sheaths: Open, crowded, overlapping, mostly glabrous but often hairy on margins at collar; no auricles. Ligules: Short, dense fringe of hairs. 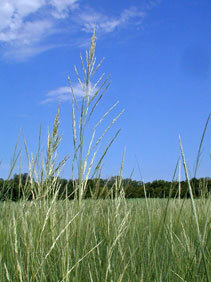 Inflorescences: Panicle, mostly narrow to loosely spreading, 4 to 16 inches long; branches slender, erect or ascending, smooth; lower branches 4 to 5 inches long. Spikelets: Flattened, about 1/4 inch long, 1-flowered, crowded; glumes unequal, 1/4 to 1/3 inch long, 1-nerved, rigid, papery; tips pointed; lemmas 1-nerved, glabrous, conspicuous tuft of long hairs at base; awns absent. Habitat: Sandy habitats; sandhills, sand prairies, loose sandy slopes. Distribution: Primarily north 1/2 of Kansas. Forage Value: Though coarse and not particularly palatable, livestock will consume the early growth. It will disappear under heavy grazing. Uses: The Lakota wore the inflorescence on their heads as a war charm instead of feathers and used it to clean their pipes. Comments: Prairie sandreed spreads quickly via rhizomes and seed, making it an excellent sandbinding grass. It is sometimes used to stabilize blowout areas.